Traveling and experiencing new things is a huge part of my DNA, what I love to do and a major reason I work so hard! 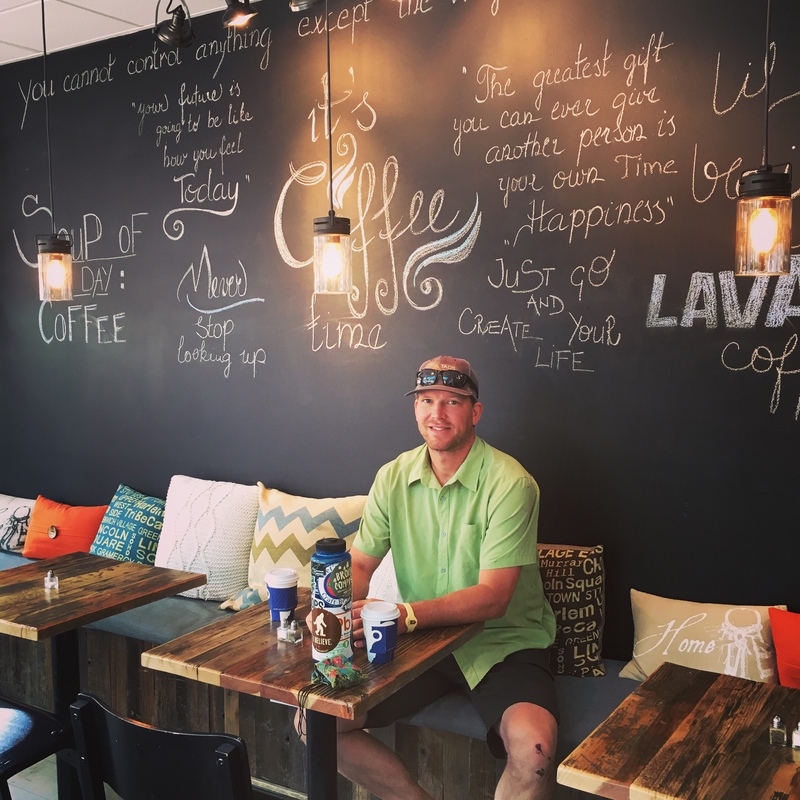 Having moved to Colorado back in December of 2013, we’ve thoroughly enjoyed traveling to new places….Ireland, Vieques, Amalfi Coast, Belize, Jackson Hole, Park City, Moab, Oregon…to name just a few! That being said, there are literally thousands of places to travel, trails to hike, mountains to climb, beers to drink, rivers to raft on, paths to bike on in the glorious state of Colorado. 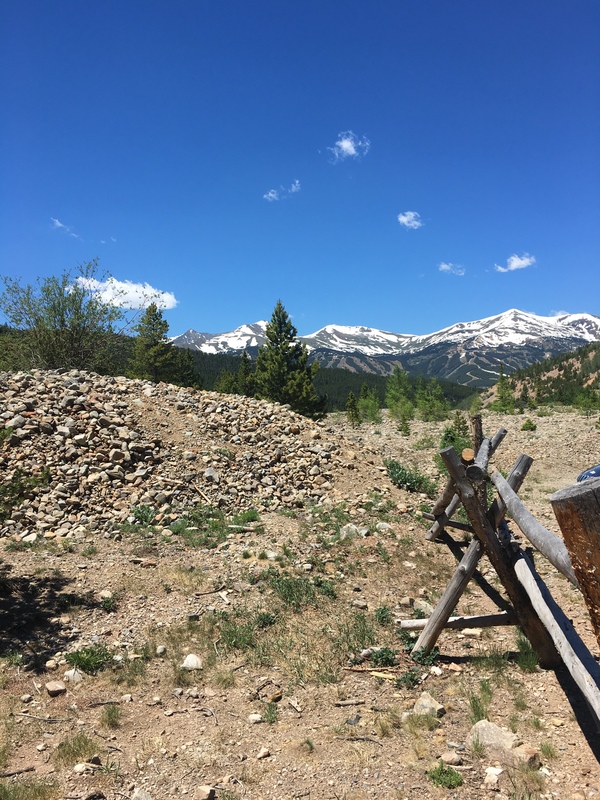 So, when we bought a time share at the Grand Lodge at Peak 7, the idea of spending a week up in the mountains, in our own backyard, was exciting! 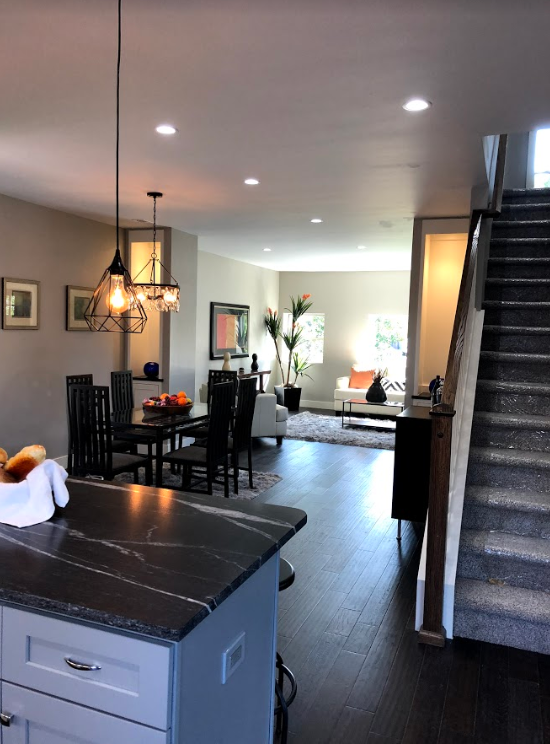 Although we typically head to Breckenridge in the winter for the glorious skiing….that’s pretty much why we bought the timeshare to begin with, so we would have ski-in, ski-out access. It’s been great. Our week approached (we have odd years, in the summer) and we packed up, hit the road, and headed for the mountains. The first half of our Staycation was incredible…..biking, great restaurants, gorgeous sunsets, craft beer, and that was just through Tuesday! Part II of our Staycation began on Wednesday, with a gorgeous morning walk on the mountain with the doggies…coffee in hand. Working on East Coast hours allows me to wake up early to enjoy the morning before most people have even stirred. It’s really a gift to get up with the sun, especially when you’re in the mountains. By 6:30 am I was back in the room working, while Mike planned another mountain bike ride. The plan was that I’d wrap up my morning and head to meet him, riding my bike down into town. It was a wonderful afternoon and I was pumped to get back on my bike. We finished our ride and headed back up on the gondola so I could finish up my day. The gondola drops you off right at the top of peak 7 – so convenient! Our bikes fit in the gondola car, so we could avoid riding up the steep hill. So nice! After I wrapped up the work day, we headed to another private movie in the Grand Lodge, brought snacks too, watched Bad Moms (which was horrible!) then headed out to soak in the hot tub to overlook the mountains. It was officially a perfect end to a glorious day. I took Thursday and Friday off, so when we woke up on Thursday, I was so excited! It was Breck Bike week and there was a women’s beginner mountain biking clinic from 10 am to noon so I got dressed like it was Christmas. To fuel up, we headed down to town to somewhere we’ve not ever been, Mom’s Baking Company. A European style bakery, with cozy seating and beautiful decor. Mike ordered a burrito with french cheese and caramelized onions while I had a spinach & mushroom pastry. It was perfection! I rode over to the Blue River Plaza where the clinic was meeting. 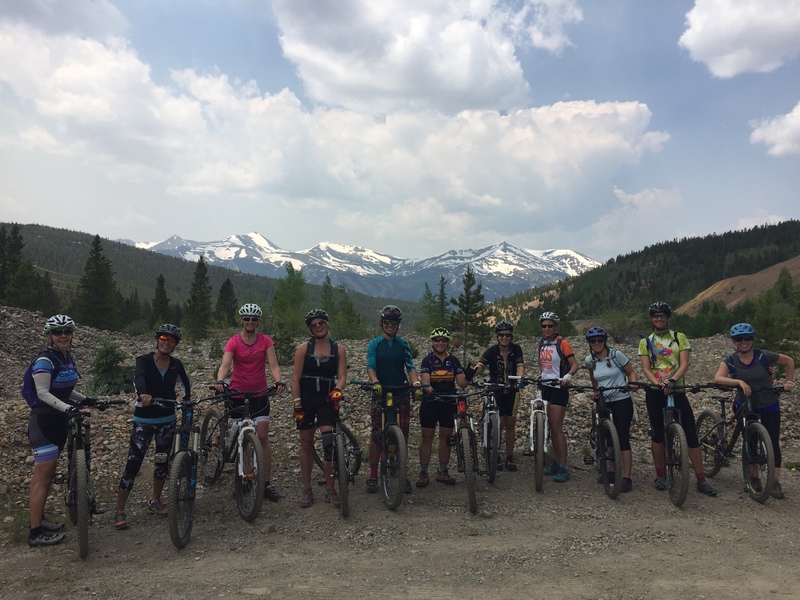 The ladies who gathered were at all different levels – some had never mountain biked ever, some were recovery from injuries (myself included) some had been out of the saddle for awhile. 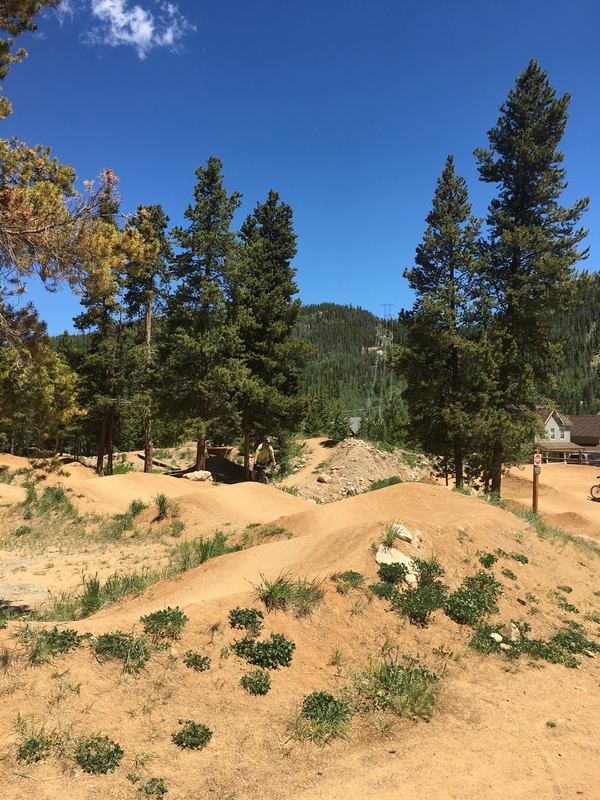 Our instructor Kat was awesome, a chill mountain chick who had great pointers and took us to the pump track then the B n B trail where we practiced uphill and downhill skills. It was an amazing day – my first time taking a bike clinic and boy was I a fan! Mike met me back in town where I poured over the details of the day. We headed to Park & Main for lunch (again!) where we got beet sliders and a huge arugula vegan salad and Mike got the zucchini parm (again!). It was delicious! I was wiped afterwards, so we headed up to the lodge where I promptly showered the sweat off and took a rest before meeting a girlfriend for happy hour at the Blue Ridge Bistro. Although I had a pretty bad experience there early in the week, their happy hour is great (2 for 1 appetizers) and $2 off drafts. Plus, my girlfriend could walk there, as she worked in Breckenridge. We had a blast catching up and after BRB, headed to RMU for some drinks and ski shop shenanigans. Great bartenders and a hipster vibe….Mike has quite a few Manhattans while chatting up the owner, who he claims wants him to be a sponsor. Fun, fun night! Friday morning came a little slower and after we awoke, got coffee and walked the pups on the hill, we got our bike gear on and headed out, down the four-o clock run trail, through the construction they’re doing to create a traffic circle through town, and to the Bold Restaurant for breakfast. 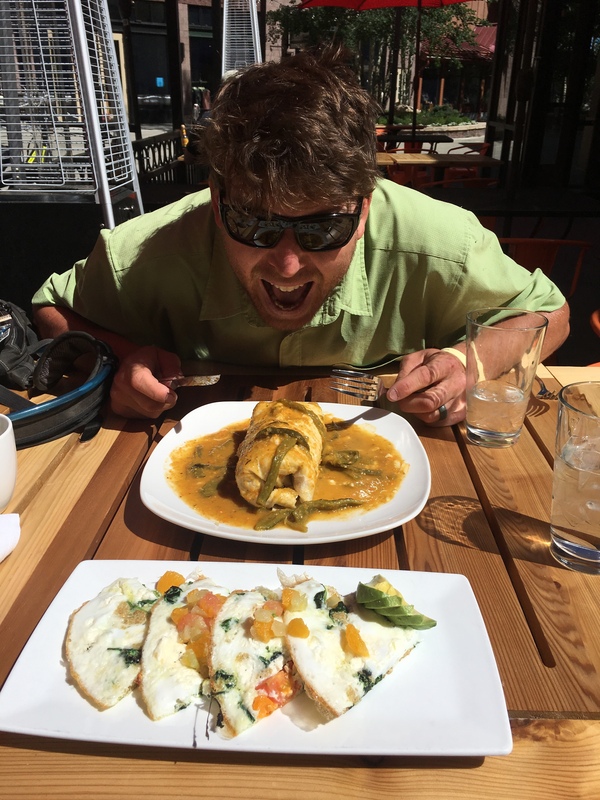 Mike ordered the huge breakfast burrito with veggie green chili and I had an quinoa & egg white frittata with citrus salsa. Oh yes, we were fueled! After breakfast, we hopped on our bikes and headed to the pump track. A crew of little kids were there, ripping, so Mike and I jumped in and tried not to let them beat us. I had done the track yesterday, so was very pumped to show him the ropes, although he smoked me. It was a blast! We climbed up above the course to a small track that took up up and down and around, back to the road, where we headed to the B n B trail. 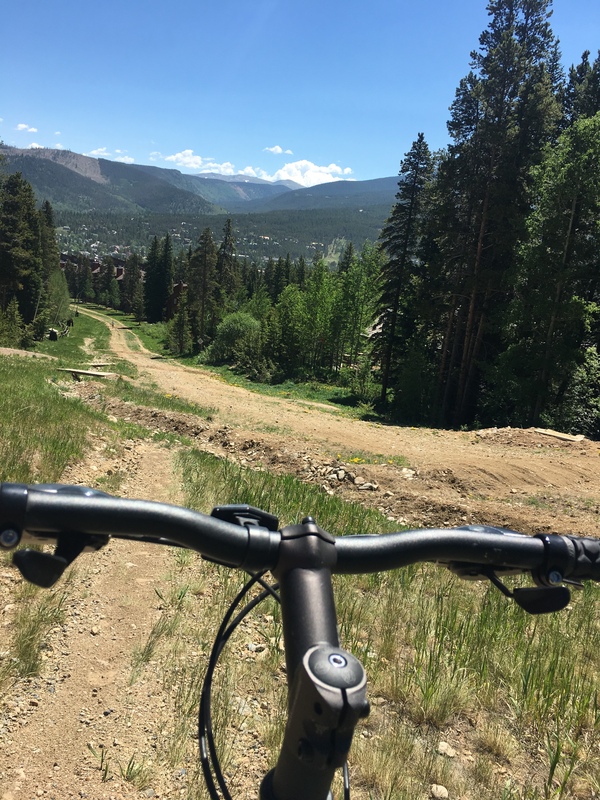 Instead of following the trail I did in my women’s clinic, we took V3 to Barney Ford to Barney Flow to Carter Park….oh man, if you’re ever in Breckenridge and want an amazing ride, do this one! Nothing crazy hard, definitely some climbs and rocks (that I walked my bike over, as technically I wasn’t supposed to be mountain biking at this level with my ACL recovery) this was a great ride! And the VIEWS!!! It couldn’t have been a better day! Biking back into town, we both felt wonderful and hungry! Heading to Mi Casa, an incredible Mexican restaurant with the best margaritas I’ve ever had, where we ate our faces off! 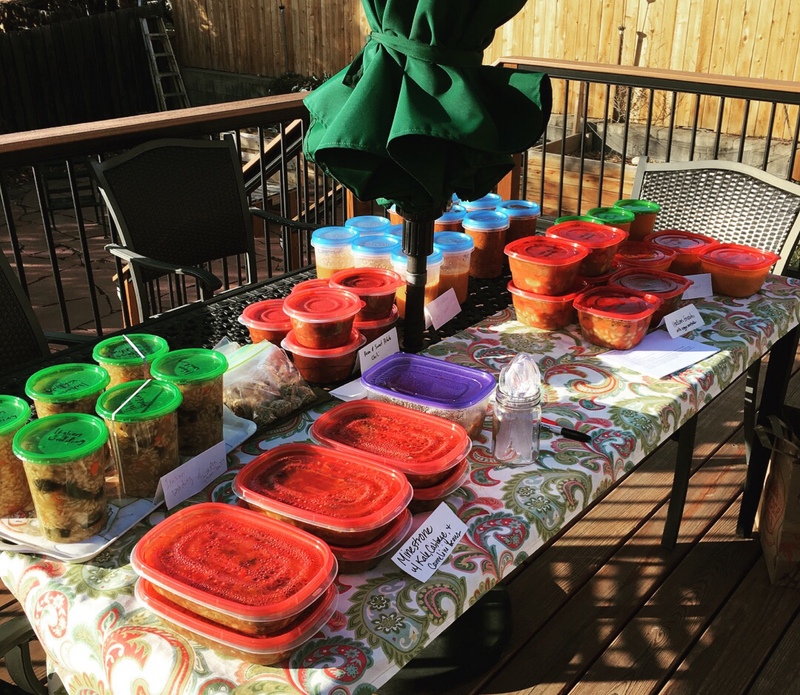 Guacamole, sweet potatoes tacos, homemade chips….oh my! Our cousins were heading our way that evening, so after paying the check we headed back up the gondola, took showers and rested before our guests. The evening brought grilled veggies, good beer and hot tubbin’! 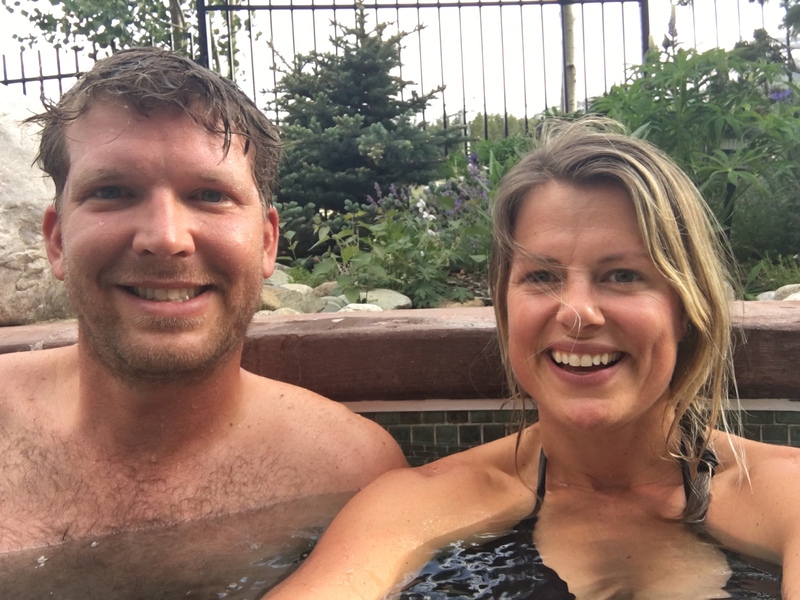 The cool mountain air was perfect, so we stayed outside late, talking, soaking and enjoying being in Colorado. 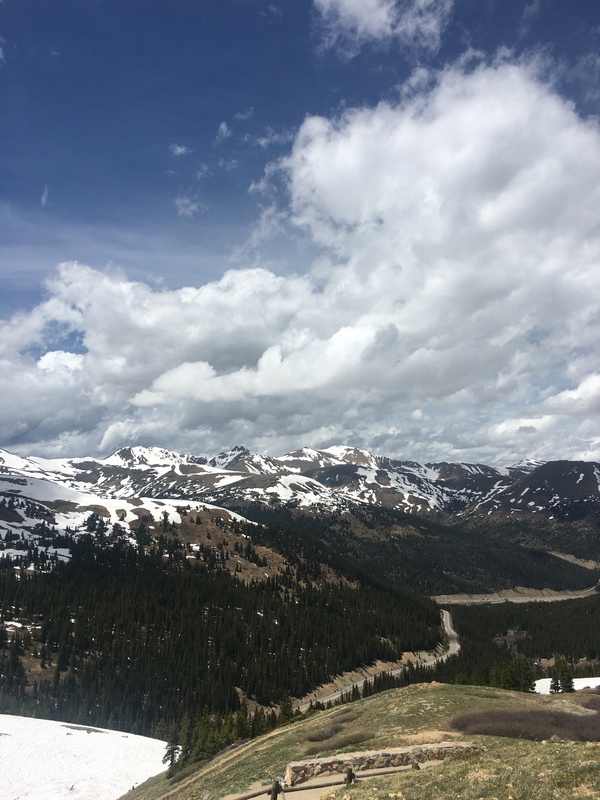 Saturday, we awoke and planned our hike…Spruce Trail to Mohawk Lake. The hike was amazing, with several lakes and waterfalls, it was the perfect end to a wonderful Colorado staycation. At 11,300 feet & 6.5 miles I have to say, my knee was back! All-in-all, we had such a fabulous time in the mountains, exploring the wonderful trails, town, and mountains. Make sure to get outside and enjoy the wonders of summer, especially those you find in your backyard!